We often talk about our target of 50 countries we hope to visit during our trip and Leighton wanted to help in this regard and invited us to add a country to the count. Sharon unfortunately could not join us as she was on a four day trip to the Philippines with the church. The destination for our day trip was Macau. 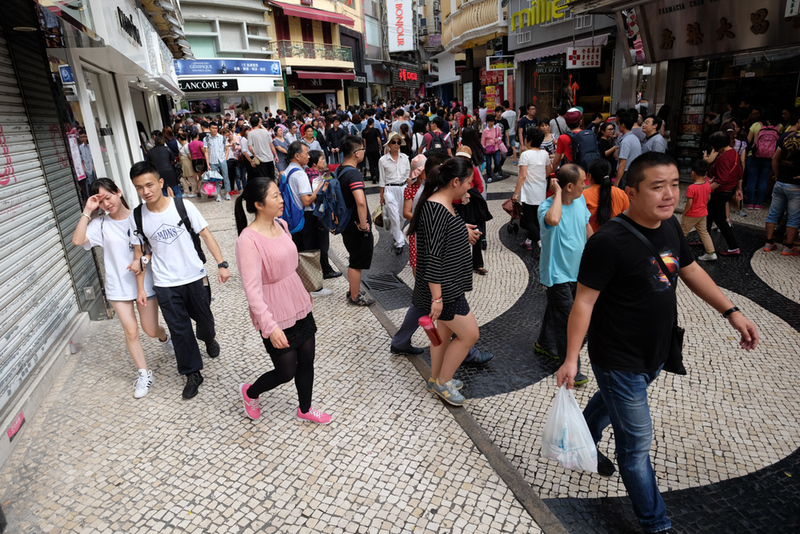 Google has this to say; "Macau is a small peninsula in mainland China, across the Pearl River Delta from Hong Kong. A Portuguese overseas territory until 1999, it reflects a mix of Portuguese and Chinese influences. Its giant casinos and extravagant malls have earned it the nickname, the "Las Vegas of Asia." Boarding the Turbo Jet Ferry was in many ways similar to boarding a plane and one hour later we were in Macau. Very efficient customs clearance! This was the first really hot day we have experienced here and we were drenched in sweat by the time we reached the famous ruins of St. Pauls. The Monte Fort, with its impressive walls and cannons provided a great view of the City and Mainland China in the distance. We walked through an older part of the city, which is quite different from what we had seen in Hong Kong. Thousands a scooters rushed through the narrow streets and the level of decay stands in a stark contrast to the casinos we taxied by only minutes later. The appearance of casinos here was a complete surprise to us and the sheer scale of the construction and infrastructure to support the casinos were mind boggling. We had a late lunch at a remote beach in very cozy restaurant "Fernando's", which the Duleys have frequented many times. We were treated to a marvellous Portuguese meal with Sangria in an outdoor court yard setting. As much as I would like to avoid the next paragraph there is no way around it. I may as well admit that I lost my camera on the ferry back to Hong Kong. Yes... there will be no more photos. The blog is ending right here, right now!!!!! Okay, and now to the more detailed version. Pre occupied with my passport and a customs form in hand I did indeed walk right off that ferry without my camera. I still cannot believe it. I have been mad, disappointed and blaming myself to no end. A shame to end such a great day on a sour note. But look at the bright side. Now I have a perfectly good excuse to shop for a new camera and I am in Hong Kong, a shoppers paradise. A huge thanks to Leighton for taking us to Macau and for letting me post his photos here in the blog.